"I think this is an absolutely fantastic editing app that any photographer – amateur or pro – needs to get right now." Do you have hundreds of photos on your Mac waiting to be sorted out and edited? 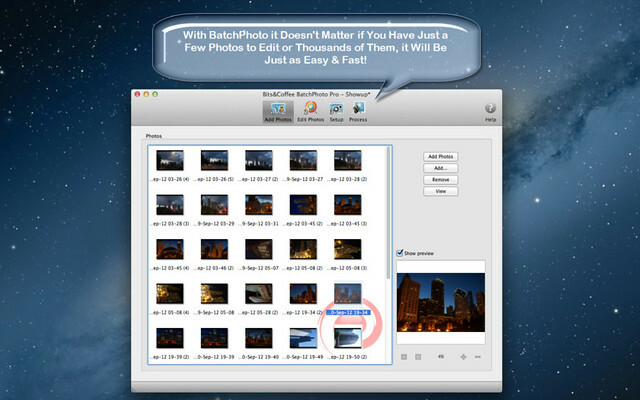 With BatchPhoto it doesn't matter if you have just a few or thousands of them, it will be just as easy & fast to edit them! Instead of enhancing and adjusting pictures individually, BatchPhoto lets you select a group of images, define a series of edits, and apply them in a single operation. "If you need time/date stamps, image type conversion, size changes, basic touch-up, or watermarks applied to your photographs, BatchPhoto will allow you to do this simply." "Filters and effects are really what make BatchPhoto special. Features in editing your batch are very, very extensive. Every filter you can imagine is available in BatchPhoto"